...... number of changes detected. The sync server may be controlled through the network using a client GUI application or the regular SyncBreeze command line utility, which is available in the SyncBreeze Ultimate and SyncBreeze Server installations. 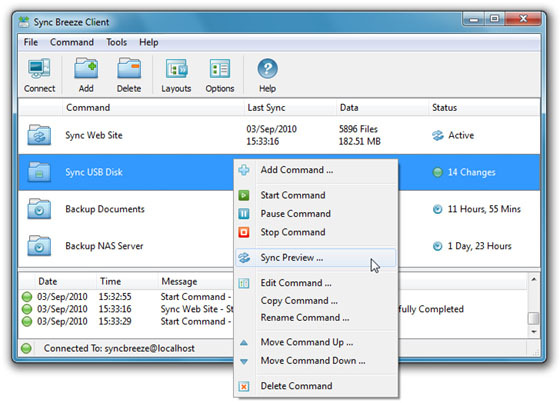 The GUI interface provided by the client application is almost identical to the standard SyncBreeze GUI application making it very simple to manage and control file synchronization commands. In order to connect to the sync server, start the SyncBreeze Client application, press the 'Connect' button located on the main toolbar and specify the host name (or IP address) to connect to and a valid user name and password (the default user name and password syncbreeze/syncbreeze). Qweas is providing links to SyncBreeze Server 4.5.10 as a courtesy, and makes no representations regarding SyncBreeze Server or any other applications or any information related thereto. Any questions, complaints or claims regarding this application SyncBreeze Server 4.5.10 must be directed to the appropriate software vendor. You may click the publisher link of SyncBreeze Server on the top of this page to get more details about the vendor.